In the design world, a designer is frequently confronted with problems where the development of surfaces of an object has to be made to help him to go ahead with the design and manufacturing processes. For example, in sheet metal work, it plays a vital role, thus enabling a mechanic to cut proper size of the plate from the development and then to fold at proper places to form the desired objects. The development of surface of an object means the unrolling or unfolding of all surfaces of the object on a plane. Principle of development: Every line on the development should show the true length of the corresponding line on the surface which is developed. 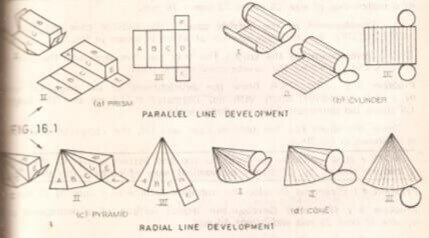 Parallel line method- It is used for developing prisms and single curved surfaces like cylinders, in which all the edges/ generators of lateral surfaces are parallel to each other. Radial line method- It is employed for pyramids and single curved surfaces like cones in which the apex is taken as centre and the slant edge or generator as radius for its development. Triangulation method is used for developing transition pieces. Approximate method is employed for double curved surfaces like spheres, as they are theoretically undevelopable.